How To Bake Fries... Belgian Fries! | Simple. Tasty. Good. How To Bake Fries… Belgian Fries! 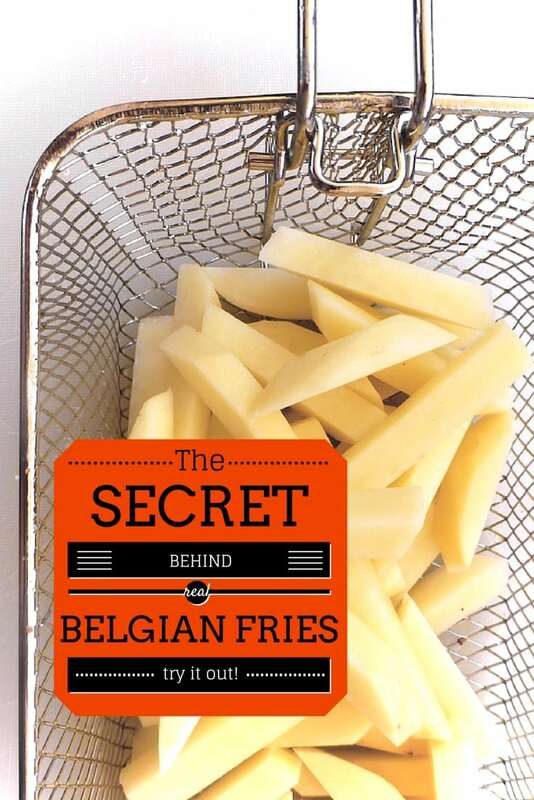 Drumroll… for I’m about to reveal the true secret behind how to bake fries… real Belgian fries! I was born and raised in Belgium so I should at least know what’s the best Belgian fries recipe, right?! Scroll down to the bottom of this page if you want to go straight to the true recipe of how to bake fries! Is it Belgian or French fries? Both names are used. But is it Belgian or French fries? I get that question quite a lot. Being Belgian, boy I’d go for Belgian of course. But I have read some theories about this question a couple of times before. One of them claims that ‘French’ in earlier times referred to frying food – hard to understand but possible. Here’s another theory I have come across quite a few times – I’m more comfortable with this one. So the story goes that ‘French’ is a misinterpretation over the years of ‘frenched’ fries, meaning sliced into sticks or sliced up finely. Anyone else got a better explanation of where the French comes from? Feel free to drop me a line or leave a comment below! 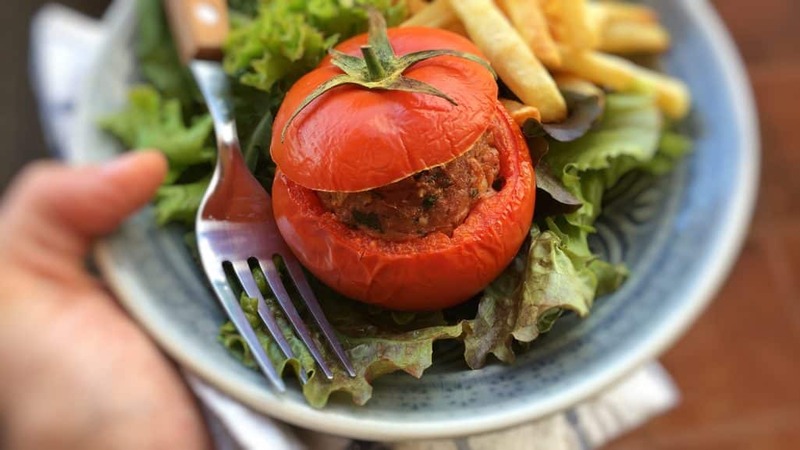 stuffed tomatoes with fries, classic! And then there’s another question: is it Belgian fries or Belgian frites? Fries in French is “frites” (from pommes frites, meaning fried potatoes). In Flemish we call them frieten or “frietjes”. The Dutch will also say friet, frites, frietjes or even ‘patat’ which is a very popular word but sounds so awkward to us Belgians. There’s this Dutch joke by the way (we make fun of each other all the time) and it goes like: “how can you see that it is a Belgian driver driving a car? He’s got a jar of mayo standing on his dashboard just in case he turns his car into fries” because there’s this Flemish expression for wrecking a car which literally means ’turning a car into fries’. Ha. Ha. Funny. OK, so you have all been waiting for THE SECRET of course! Well, it’s fairly simple how to bake fries: keywords here are floury potatoes, baked twice (double fried) and beef tallow. Let me explain that a little bit more. Next: how to bake fries… 2) fries are baked twice or double fried! First time you throw the fries into the deep fryer at about 300°F (150°C) the only purpose is to make the potato tender in just a minute or 3. Floury potatoes are perfect for that. So when the potato sticks are cooked and kinda mushy inside we will remove them from the hot frying oil and let them rest and cool. You can let the fries drain on some kitchen paper and pre bake a second batch of fries. Once the fries are cooled we are going to turn up the heat of the deep fryer to 256°F (180°C) and add the fries back to fryer. Now that the potato is tender on the inside the hot oil will crisp up the outside. Third important aspect about how to bake fries: the best fries are fried in 3) beef tallow which is melted and filtered beef fat. It’s cheaper than frying oil (at least in Belgium) plus beef tallow is more resistant to oxidation and burning after heating than frying oil. Also beef tallow gives a slight extra beefy almost gamey flavor to fried food. Even Wagyu tallow exists! 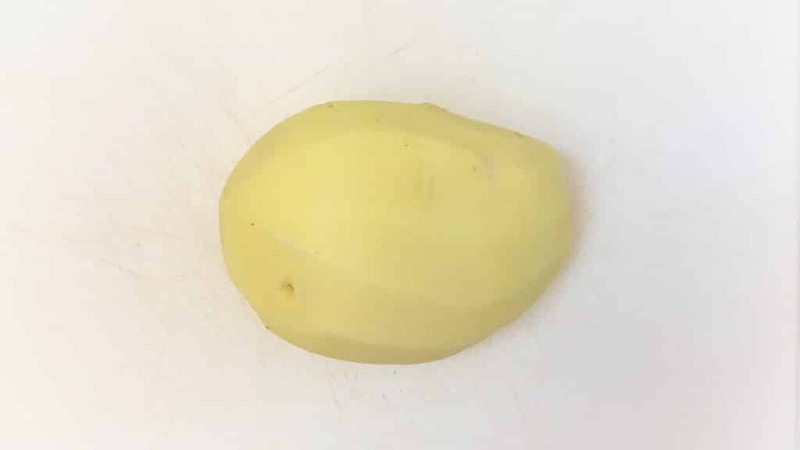 Just imagine how that tastes like… Nowadays fries shacks mainly use vegetable oil because there’s more unsaturated fats in it than in beef tallow. Oh! Them glorious fries shacks! You can find these little places of fried heaven all over Belgium. 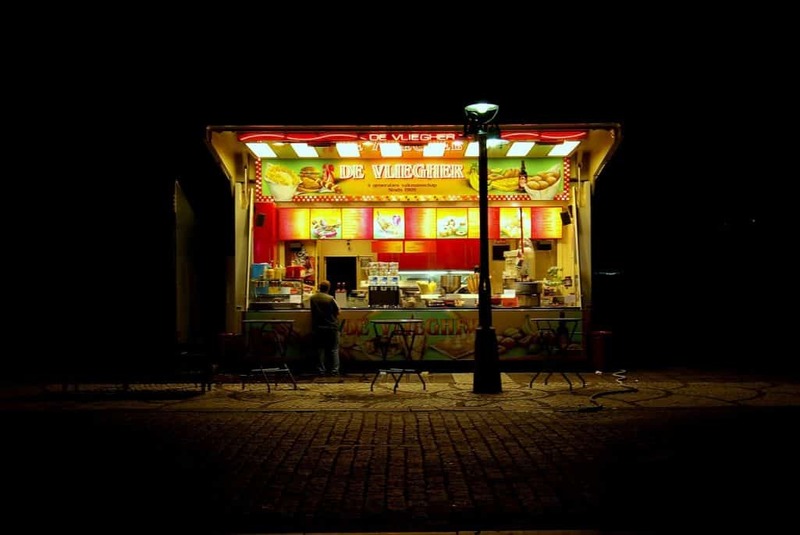 Going to the ‘frituur’ (friture in French) or fries shack is a very popular way of saying you are having (takeaway) fries for dinner: you can eat them on the spot or take them home. I know quite a lot of Belgian people who deliberately don’t own a deep fryer but whenever they are having steak or any fries dinner they drive to the nearest shack and order a portion of freshly baked fries. So here’s how to order your fries in Belgium: you have to choose between a small, medium or large portion of fries. For me medium is more than enough. All these fries shacks sell other stuff like hamburgers, meat croquettes (I love the Dutch ‘bitterballen‘), frikandel sausages, meatballs, shrimp croquettes, cheese croquettes, skewers, chicken wings, chicken nuggets, chicken fingers… and I could go on for ages like that. Gosh, this makes me hungry! So either you go for a portion of golden fries with an extra fried treat on the side or you just have fries for dinner. Absolute yum. Dipping sauces are charged extra: mayo, tartar sauce, ketchup, curry sauce… or the highly delicious meat stew sauce called ‘stoofvleessaus’. I’m drooling all over my laptop just writing about it. Some people like their sauce squeezed right on top of their fries, others want their sauce neatly served in a separate plastic container to dip their fries in. If you prefer the latter, mention that to the frituur owner while you place your order. Some will automatically ask you how you like your sauce served. Personally I don’t have a preference. As long as it’s got fries, then I’ll eat it. Paper cone or paper tray? Even though paper cones look awesome they are hard to find nowadays at fries shacks. Restaurants use cones very often but those are actually ceramic cones that come alongside the steak or fish or seafood you ordered. 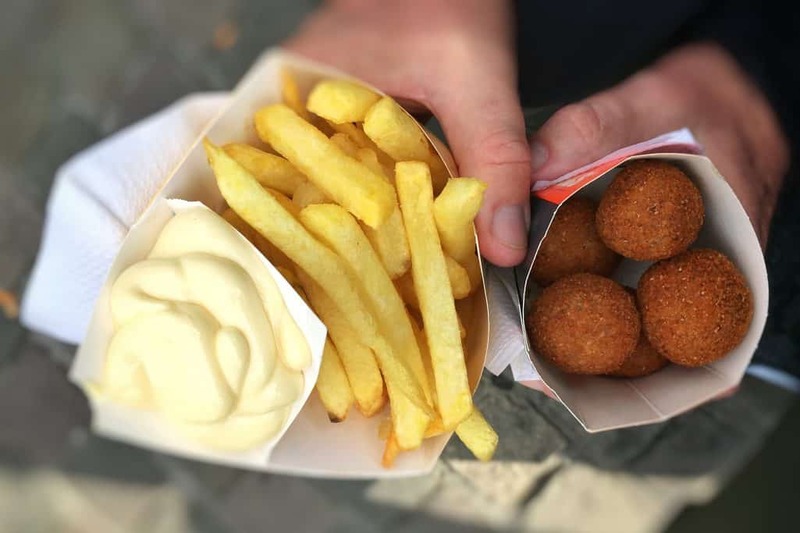 The fries that you order at the ‘frituur’ will usually be served in a cardboard (even plastic) tray wrapped in paper layers. Another question that I get a lot. Do you eat fries with you hands or with cutlery? 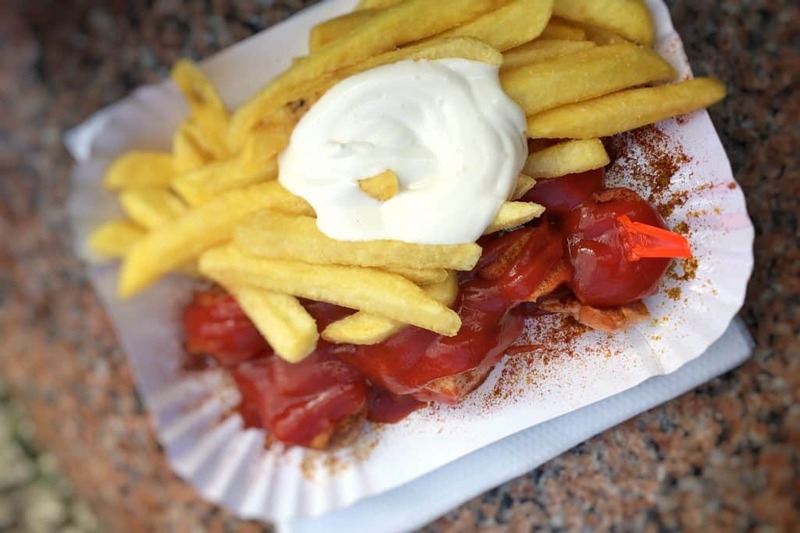 Every frituur will provide you with a couple of wooden or colorful tiny plastic forks but in general do as you like. You can eat your fries with your hands, that is totally normal! Again I have no personal preference: I do both. Because my mom and dad did not own a freezer when I was a child we would make our own fresh fries from scratch every single time. 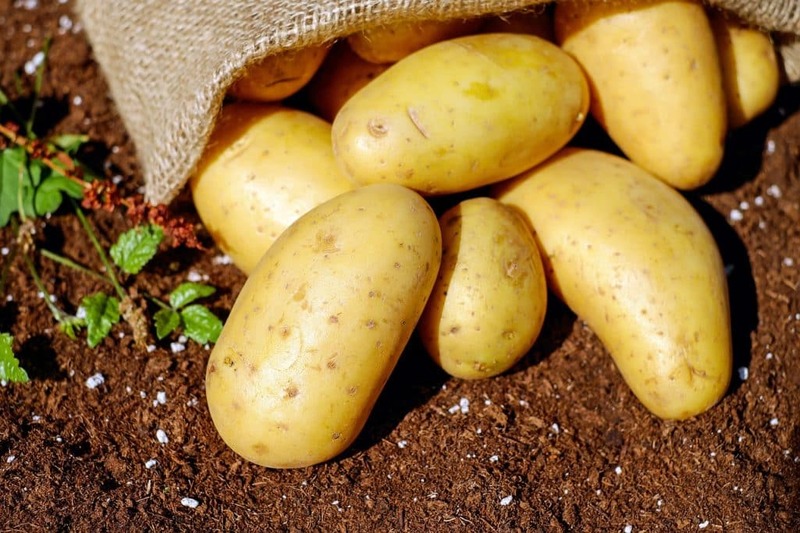 That then was mostly on Sundays after mass and I must admit that on those days every one of us would help out in the kitchen peeling and slicing potatoes without nagging and complaining. Even the grumpy ones who hates helping out around the house. Why is that then? Because the reward afterwards was just awesome… Bowls of freshly cooked fries on the table mmmm we all loved that. I have 4 siblings plus 2 parents… that makes 7 stomachs so you can imagine what a heap of potatoes and sliced fries that must have been then! And just imagine what a pool of mayonnaise we would devour. 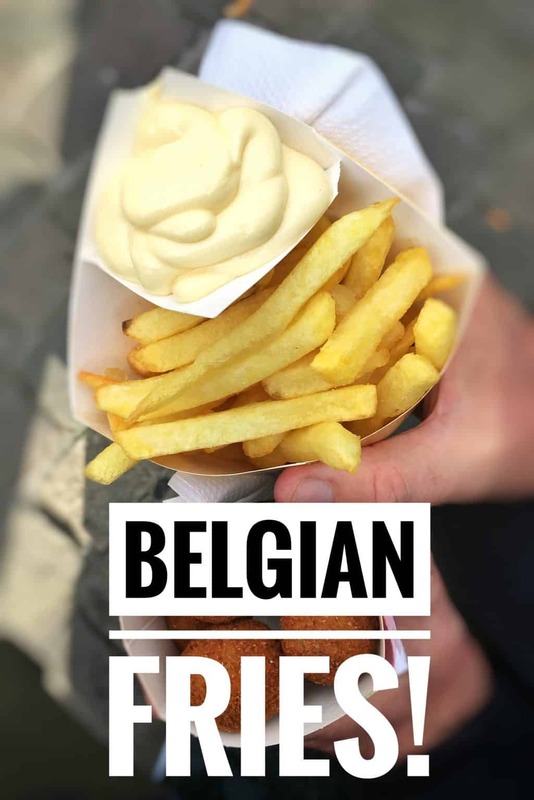 So here it is then, allow me to share a piece of my childhood nostalgia with you… here’s the best Belgian homemade fries recipe you will ever come across! The secret behind how to bake fries... the best Belgian fries recipe! How are classic Belgian fries prepared? Everything you want to know about fries! Peel the potatoes. Don't rinse them! Now place the potatoes on a clean chopping board and slice off a little sliver from the side. This will help us to slice the fries evenly in thickness. 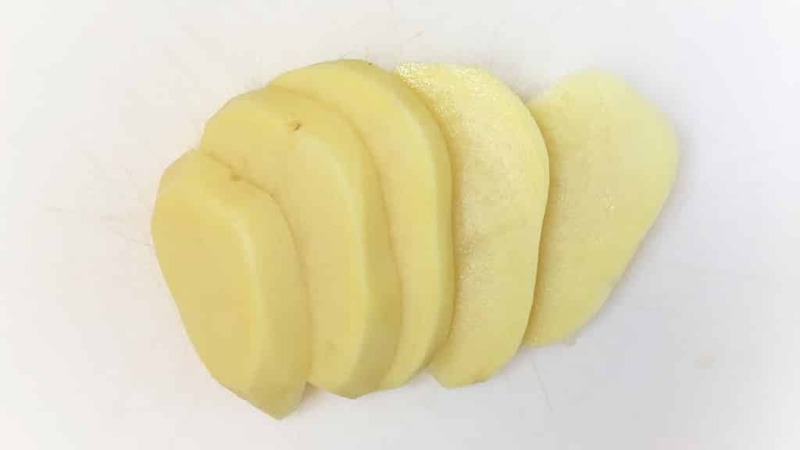 Slice the potato into even slices: they should be about a little less than half an inch (1 cm) thick. If at the end the last slice is too thin, discard it or keep it for another recipe. Then place the slices side by side and cut them into even thick sticks: about a little less than half an inch (1 cm) thick as well. If you feel comfortable enough, you can stack the potato slices on top of each other and cut them all at the same time into thick sticks. 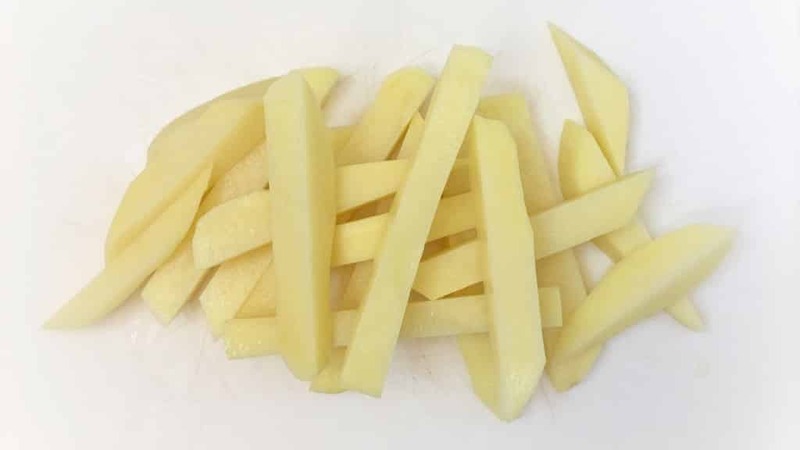 If there are much thinner potato sticks, again discard (thin fries will burn much quicker than the thick ones) or keep them for another recipe. Once you have sliced up every potato, heat your deep fat fryer to about 300°F (150°C) and heat up the frying oil (or melt the tallow if using). Divide the uncooked fries into portions depending on how large your fryer and frying basket is. About 2 handfuls is enough. You can do this is batches of course. Once the oil is hot, precook your first batch of fries for about 3 minutes. That done, remove the fries from the hot oil. They should be quite tender. Don’t shake them or you will break them. Let the precooked fries cool. You can let them drain on some kitchen paper and pre bake a second batch of fries. Once all of the fries are precooked and cooled, to turn up the heat of the deep fryer to 356°F (180°C) and add one batch of precooked fries back to fryer. Fry them until golden and crisp in about 3 to 4 minutes. Once that is done, remove the fries from the hot oil and shake them well. Then transfer them to a bowl or deep dish lined with kitchen paper and sprinkle with some salt. Serve this first portion of golden fries while you are frying another batch of them. That's how to bake fries, now enjoy!